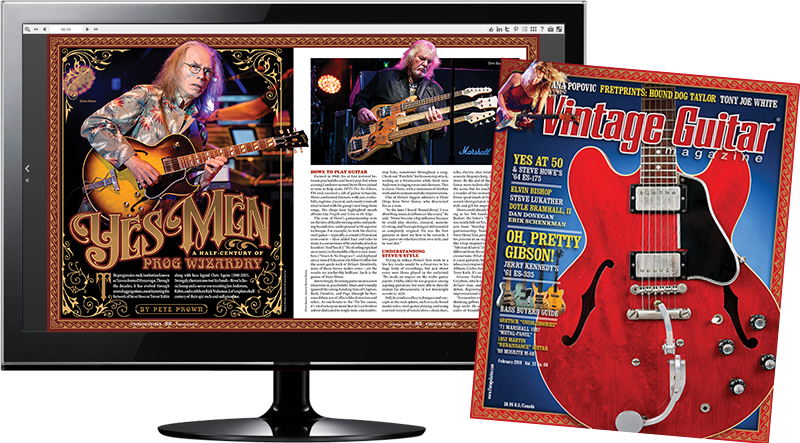 Find what’s in this issue, enter the latest exclusive VG giveaways, or learn the ways to get your Vintage Guitar fix! Don’t forget to check out the playlist for this issue of VG on Youtube. When assigned a session with Roy Orbison in the summer of ’64, a young studio guitarist brought his favorite instrument. Read about Jerry Kennedy and the famous lick played on his one-of-a-kind Gibson ES-335. We also offer the final interview with legendary Louisianan Tony Joe White and dig into the ’57 Stratocaster given to him by Waylon Jennings. Enjoy our look at 50 years of prog wizardry by Yes, then explore the stories behind early Gretsch “unsolidbody” electric guitars and the Mosrite M-88, dig into the Marshall Model 1987, and learn why Martin’s “Renaissance” guitars rank as a rare failure in the company’s storied history. We catch up with Steve Lukather, Doyle Bramhall, II, Elvin Bishop, Ana Popovic, Erik Schenkman, Dan Donegan, Steve Tibbetts, and Abe Ovadia. Wolf Marshall schools us on the history and licks of Hound Dog Taylor, “Pop ’N Hiss” dishes on Def Leppard’s Pyromania, and Dan Forte’s “Check This Action” features root-rock acts worth hearing. Our “Hit List” reviewers guide you to the best new music, while VG Approved Gear highlights toys for your jam room (or gig rig). You’ll love in the February issue, available now! The Beatles, Hendrix, Asleep at the Wheel, John Blair, Steve Lukather, Ana Popovic, Jason Isbell, Hadden Sayers, more! The latest cool new stuff! Send letters to ward@vintageguitar.com or mail to: Vintage Guitar, Inc. Attn: Reader Mail, PO Box 7301, Bismarck ND 58507. 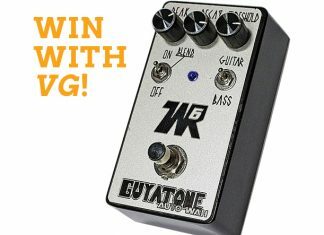 Send your photos to: ward@VintageGuitar.com or mail to: Vintage Guitar, Inc. Attn: Readers Gallery, P.O. Box 7301, Bismarck, ND 58507. Readers submit photos with the understanding that they may be used in any VG, Inc. project. Due to the volume of photos we receive, we are unable to return them, please do not send us your only print. 1. Print › › Receive the print edition by subscribing now. Order print copies of the current issue or back issues in the VG Store. 2. Browser › › Read for FREE in a web browser (Chrome, Firefox, Safari, etc.). The browser edition works on most computers or hand-held devices.